Archive for tag "Ecosummit Lounge"
This Ecosummit TV episode was recorded at our second Ecosummit Lounge Berlin on 6 December 2011 at InnoZ, Berlin’s exciting epicentre for electric mobility and smart green city. InnoZ is located on the Euref Campus which aims at developing the smart green model city of the future. We enjoyed a high-voltage evening of intense Smart Green Business Networking with 5 smart green startup pitches, Ursprung, finger food and all that Jazz. The startups presenting were Flinc, Nachbarschaftsauto, Ubitricity, Airbase and Changers. 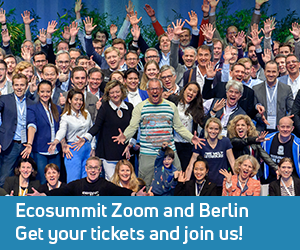 Ecosummit and InnoZ, Berlin’s exciting epicentre for electric mobility and smart green city, joined forces to invite you to a high-voltage evening of intense Smart Green Business Networking. Our second Ecosummit Lounge Berlin takes place on 6 December 2011 and is co-hosted by InnoZ’s Intelligent City Salon. From 18:00-23:00, we will enjoy 5 smart green startup pitches, Ursprung, finger food and all that Jazz. The Ecosummit Lounge is free – our Santa Claus present – but invitation-only. Please ping us to request your personal invitation code. Our new Ecosummit TV episode reviews our first Ecosummit Lounge we celebrated on 21 September 2011 at the HomeBase Lounge in Berlin. Featuring: Kai Lorenz (BT Germany), Pieter Bots (Geo-En), Jörg Fabri (allocate), Eric Mahleb (LGMi) and Jan Michael Hess (Ecosummit). Next to a few short pitches of sponsors and startups, we talked about ECO12 and the new ECO12 Award. As you can see, we had a wonderful time and want to say thanks to all participants for coming. 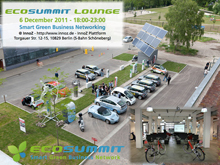 The next Ecosummit Lounge takes place on 6 December 2011 in Berlin. California here I come. 2 days after our Ecosummit Lounge I will hop on a plane to San Francisco. 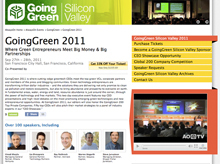 My target is the Cleantech paradise that Tony Perkins, Founder of AlwaysOn, unites at Going Green Silicon Valley 2011 which takes place on 27-28 September in San Francisco. Having joined Going Green East in March 2010 in Boston, I know what to expect: The best Cleantech VCs and startups the West Coast has on offer, everybody totally wired and inspired to save the world, grow disruptive companies and make big returns on investment. 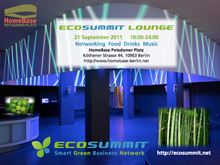 We are happy to announce our first Ecosummit Lounge on 21 September 2011 in Berlin. Ecosummit Lounge takes place in the cool event location called HomeBase Potsdamer Platz. 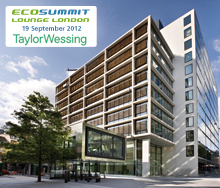 Ecosummit Lounge is a new event format we created to focus on Smart Green Business Networking in a laid-back atmosphere. From 18:00-24:00, we will enjoy a few short pitches from startups and sponsors and lots of healthy food, tasty red wine as well as funky jazz and electronic music. We will also preview Ecosummit 2012, our 3rd international Smart Green Business Conference. ECO12 features our new ECO12 Award that honours and rewards the best European smart green companies. 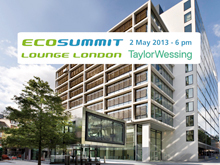 Ecosummit Lounge tickets are available and 5 speakers are confirmed!